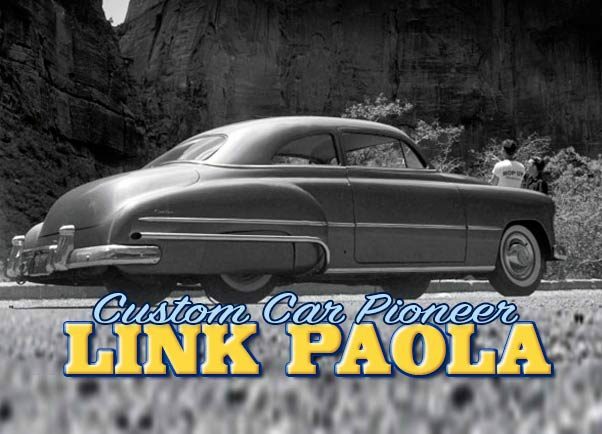 Link Paola Custom Car Pioneer from Glendale California created some beautiful Custom Cars in his career. lets take a closer look. 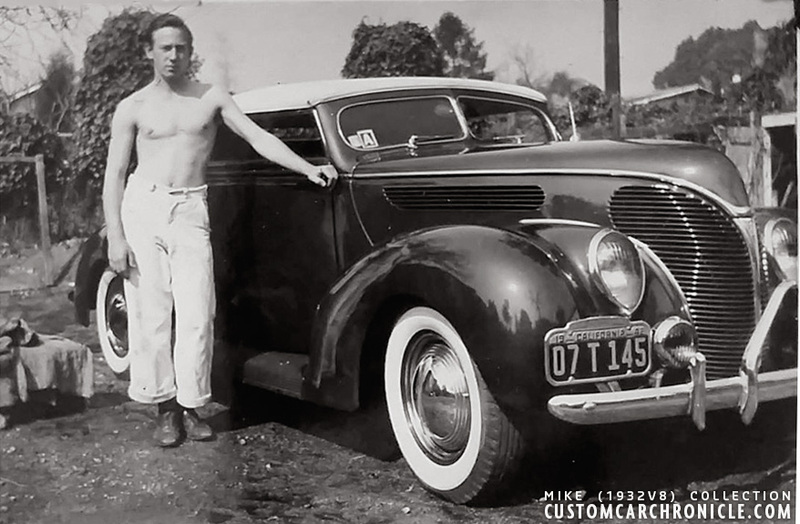 Link Paola‘s name often pops up as one of the Pioneer Custom Car body man ,together with names as Jimmy Summers, Roy Hagy, Carson Top Shop, Harry Westergard and a few others his name is forever linked to the early style Custom Car. But there are very few photos and stories from Link Paola’s work. There are a few photos of mid/late 1940’s Cars that we have to thank Spence Murray and Dean Batchelor for, who were there to snap a few of the cars coming from Link’s hands. But as far as I know there never was done a proper article on him in the early magazines. Spence Murray is the with out doubt the best source when it comes to Link Paola’s history. Spence worked for Link, and had at least four cars restyled by him. 1941 Ford, 1941 Chevy, 1946 Chevy and 1949 Chevy. Link Paola worked as a body and paint man at a large Ford dealership in Montrose, which is located a little north of Glendale, California. Linked loved fine automobiles and in the later part of the 1930’s he found out about Custom Restyling. He started to do custom work on the side at the Ford dealer ship. The work included chopping convertibles for Carson tops, removing of running boars and removing chrome trim for the smoother look. Hot Rod magazine ad from January 1949. 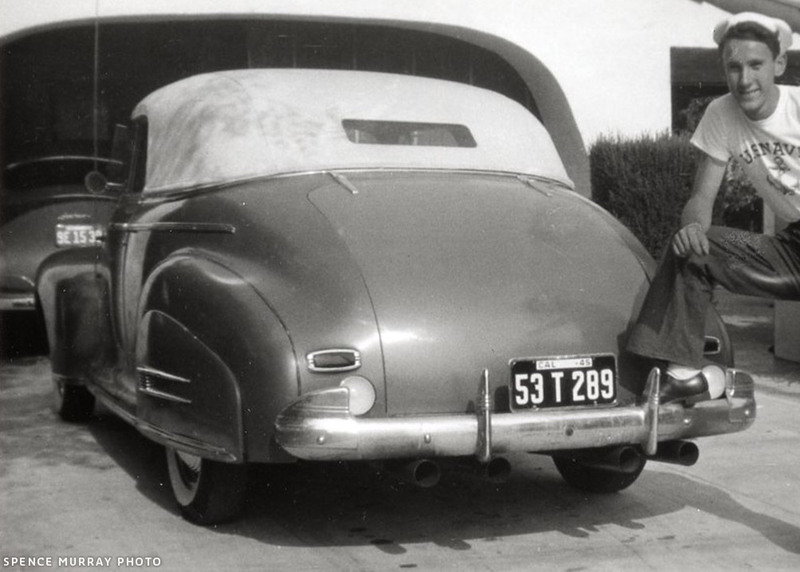 One of Link Paola’s best known and perhaps most important Customs is an super stylish done 1940 Ford Convertible. Since Link was working at the Ford Dealership, he could get his hands on a brand new 1940 Ford Convertible shortly before the cars were introduced to the public in late 1939. Normally this allowed the dealers to make showroom displays, announcement adds and all kinds of publicity needed to promote the car. But to Link this meant he could create his personal dream custom from a brand new car, before most everybody had even seen the model. After the dealership owner had signed off the car to Link he started to work on it right away, well after shop hours so that nobody could see what he was doing. When the car work was finished, he painted it dark maroon, took it to the Carson Top Shop for a tan padded top and a week later the car was all done. Just in time to display it across the street from the Ford Dealer at the day the 1940 Fords were introduced. This is how the Link Paola second shop at 3451 N. Verdugo Road in Glendale (Montrose) looks around 2018. You can imagine that Link’s very slick looking Custom drew a huge crowd, and everybody wanted to have one just like it. He took away a large crowd from the dealer who had worked hard for the 1940 Ford introduction display, but of course the stock bodied cars could not stand up to the beautiful custom Link had created. The Dealer owner was not amused at all and fired Link the same day. With having drawn all the attention to him it was the right moment from Link to open up his own body shop. In the late 1930’s he opened his own Custom Shop in Montrose which was was actually across the street from the Ford Dealer he used to work. In his first small shop he created three cars for Spence Murray, as well as most likely many more that we do not have any info about at this point. Link Paola worked from his own one stall shop for a few years and shortly after the war he relocated to a larger shop located at 3451 N. Verdugo Road in Glendale (Montrose). 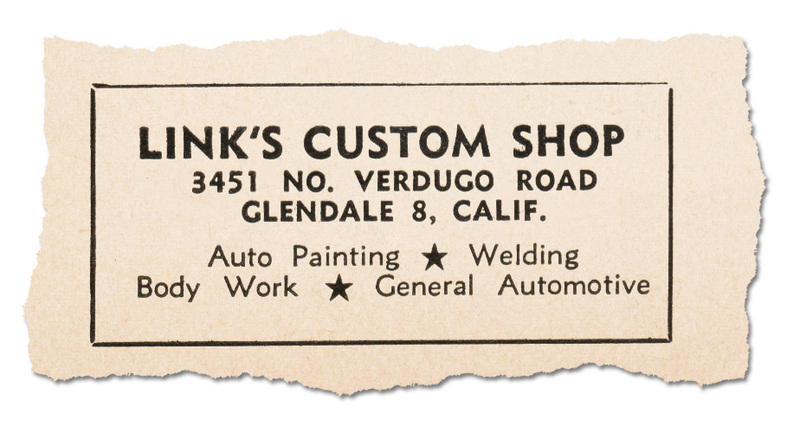 He named the new shop Link’s Custom Shop, and according a Jan 1949 Hot Rod magazine ad the shop specialized in Auto Painting, Welding and Body Work. In the beginning Link concentratd as much as he could on doing custom work, custom body work and paint. But to be able to get the bills paid he started to do more and more regular body work, straightening fenders, matching paint etc. Later he found out that he could buy totaled cars from insurance companies for very little money. He then would buy new replacement panels, or find them at the local junk yard and fix up these totaled cars and sell them. It was a way of making good money in an relatively short time. It paid a lot better than doing the Custom Work he did like better, but being able to pay the bills makes up for a lot. In 1951 Link closes his shop and buys a local Oldsmobile dealer together with his brother Pete Paola. 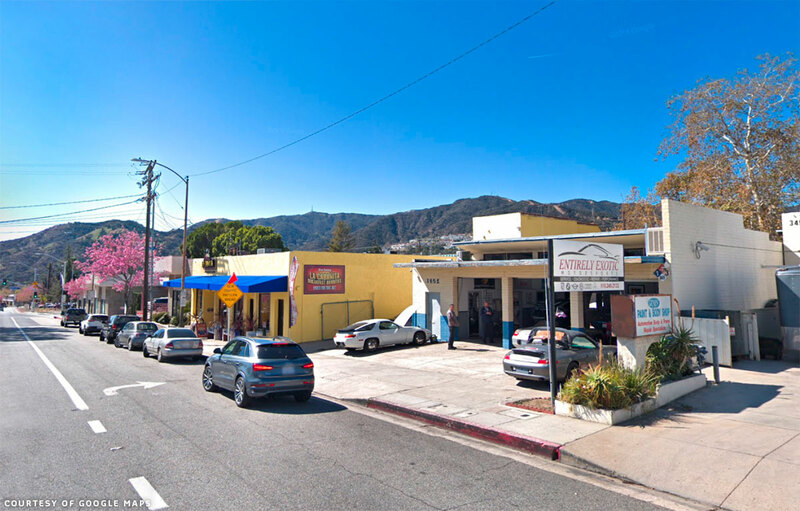 The dealer located at Foothill Boulevard and Glenwood Ave. and is named Paola Oldsmobile. It will stay in business until the mid 1960’s. Link will not work on Custom Cars again after 1951. Link Paola and his brother Pete bought the Williamson Oldsmobile dealership at Foothill Boulevard and Glenwood Ave in 1951. This photo was taken in late 1956, and stayed open until the mid 1960’s. 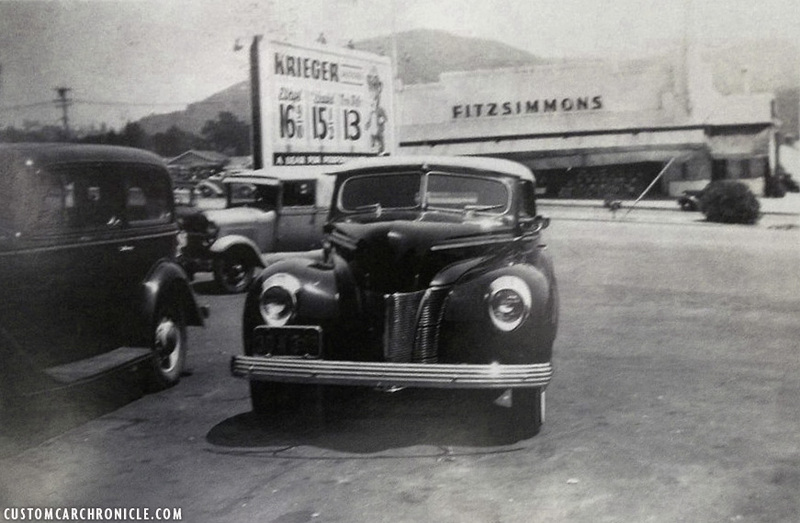 Link’s own 1940 Ford convertible was what attracted many customers to his shop. He had filled the hood, making a mild peak down the center. The deck was filled also, the front fenders were welded to, and molded into, the panels under the body (which were used to hide the frame with running boards removed). 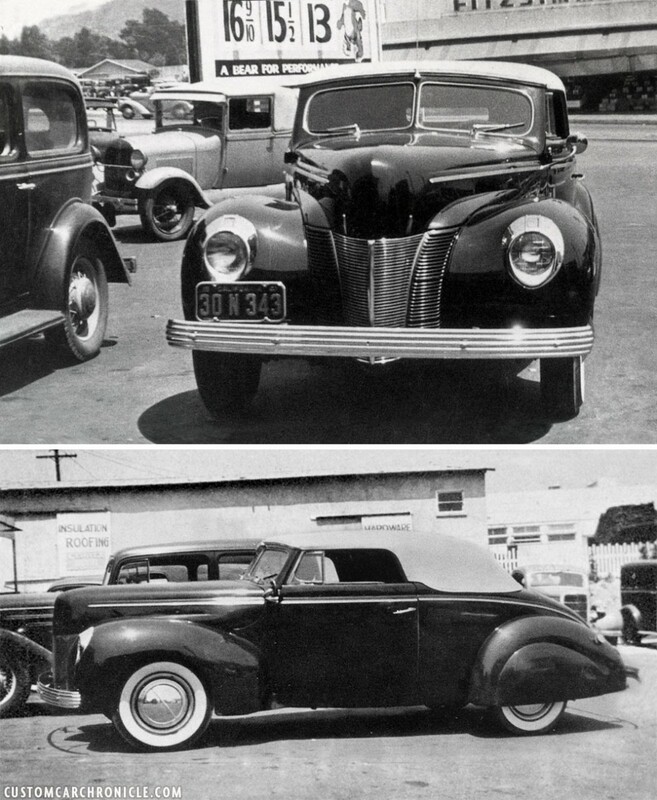 Chopped Carson top, Buick fender skirts, 1937 DeSoto bumpers and finished in maroon. Link’s 1940 Ford which he restyled in late 1939 looks absolutely stunning with it chopped tan padded Carson Top, removed running boards, ’37 DeStoto bumpers and super nice smoothed and peaked hood. These photos were taken in 1941. This picture is the same as above, but shows a bit more of the background. I love old photos. 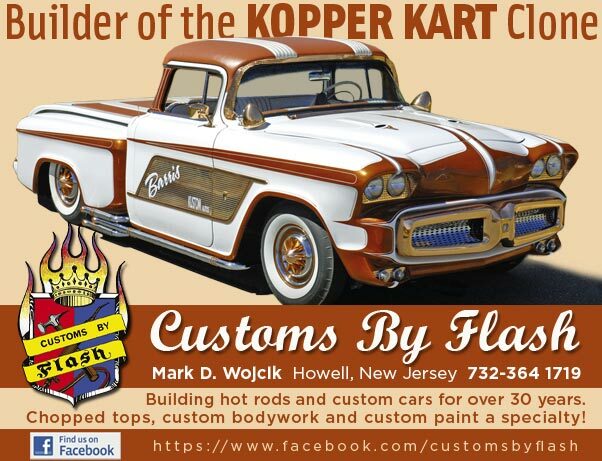 Bill Faris of Burbank, California was a Throttle Stompers member and owned this ’38 Ford Convertible. At first, only the hood ornament was removed, then the deck smoothed, and license plate sunk in. Buick fender skirts were added, and finally the windshield and side windows were chopped for a Carson Top. At the time, around 1942, they did the car both Bill and Link were in the Air Fore and the only tools they had to use where ball-peen hammer, a piece of pipe, and a few odd pliers. Link ended up painting the car in a beautiful George Washington Blue. Later, and we have not been able to find a photo of this, Bill and Link Paola shortened the gas filler and added a later model fender gas filler door to the rear fender. Early version shows minor updates as single bar flipper hubcaps. 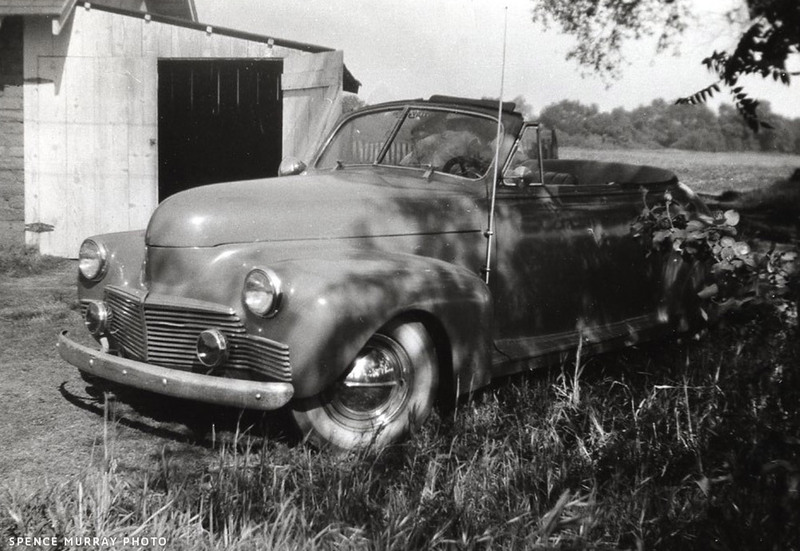 This photo of the finished Ford was taken by Dean Batchelor in front on the Valley Custom Shop owner Neil Emory’s house in 1942. Bill Faris with his beautiful heavy chopped 1938 Ford in 1942. Link Paolo restyled Dean’s Pontiac with removed side trim. The trunk and hood had the wide center trim were removed, and the large center piece of the trim on the hood was replaced with a hand shaped metal piece that was welded in places and leaded smooth. Link finished the work by painting the car light blue in 1941. 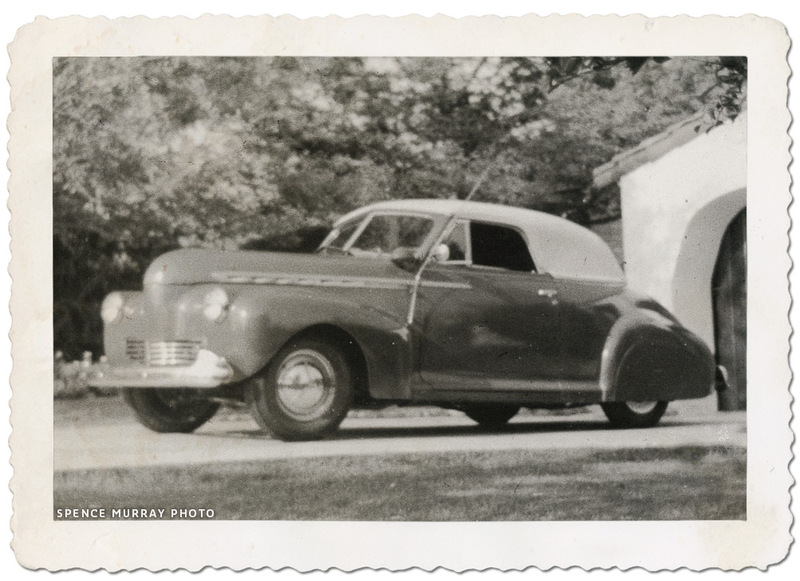 Dean Batchelor’s 1941 Pontiac before he took it to Link Paola’s Montrose shop. 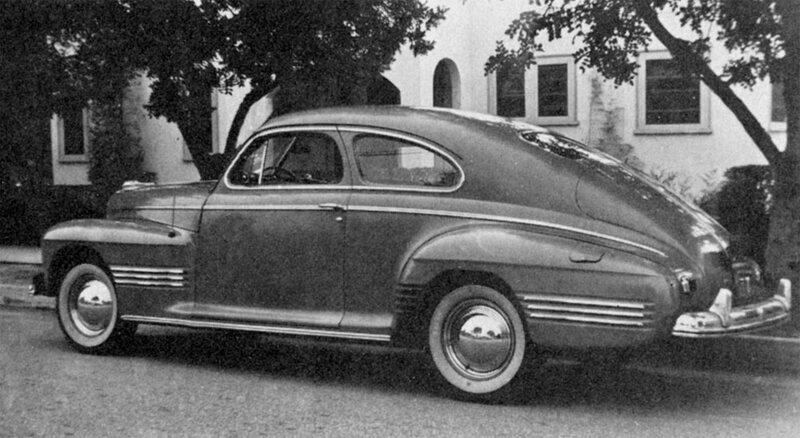 The Pontiac after Link had finished it in light blue in 1941. Subtle and elegant. Spence Murray took a few photos of an 1941 Chevy Convertible mild custom that Link worked on. 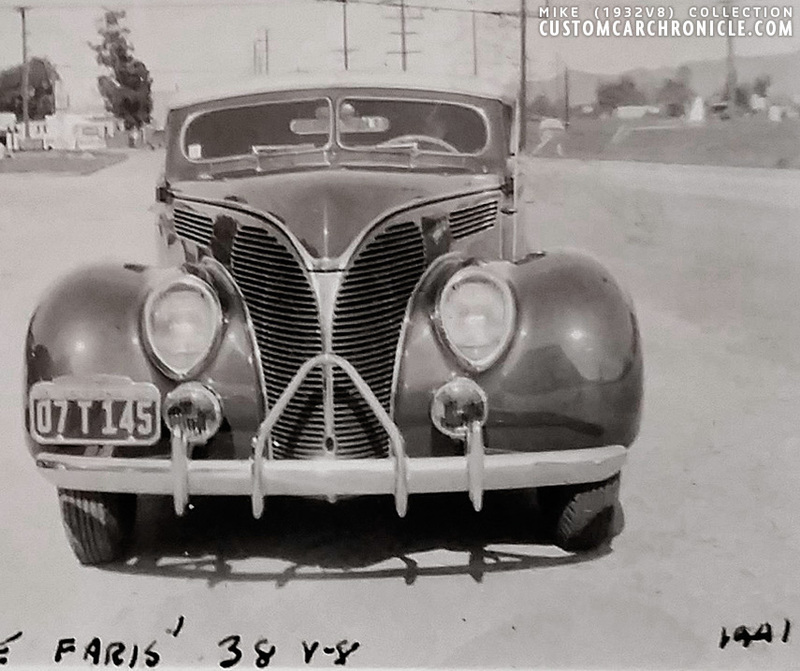 The owner is unknown, but the work on the car included a reshaped front end to accept a 1942 Studebaker Champion grille which makes the Chevy look a bit wider in the front. The hood was smoothed and peaked. And most likely Link also painted the car, but we have no info on the color, nor the owners name. 1941 Chevy, dechromed, molded and fitted with a 1942 Studebaker grille and single bar flipper hubcaps. 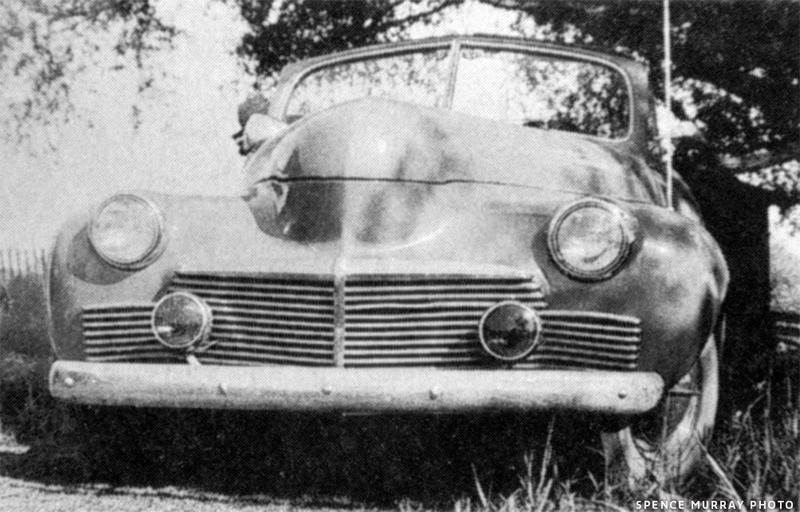 By the time Spence took the photos of the Chevy the grille had suffered a bit of damage, and a few of the Studebaker grille bars are bend out of shape. 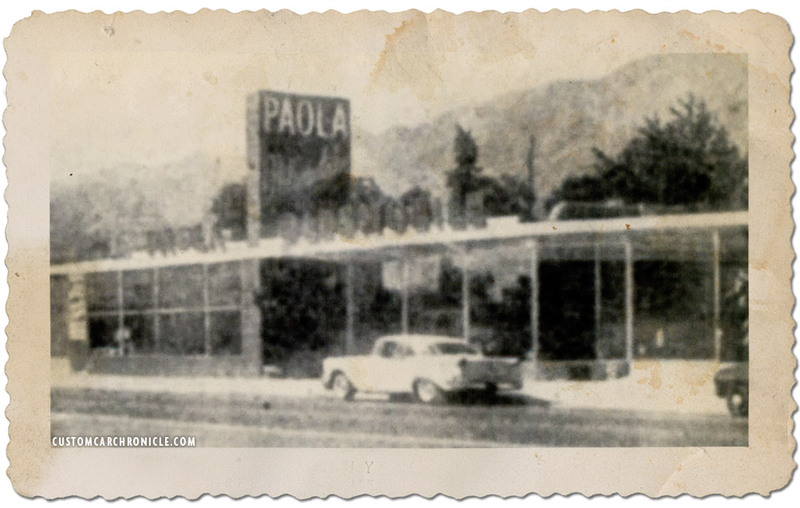 Spence met Link Paola in late 1941 when he worked out of his one stall shop across from the Ford dealer. He drove his incredible good looking 1940 Ford Convertible with padded Carson top and used it as rolling advertisements for his skills parking it in front of his shop. 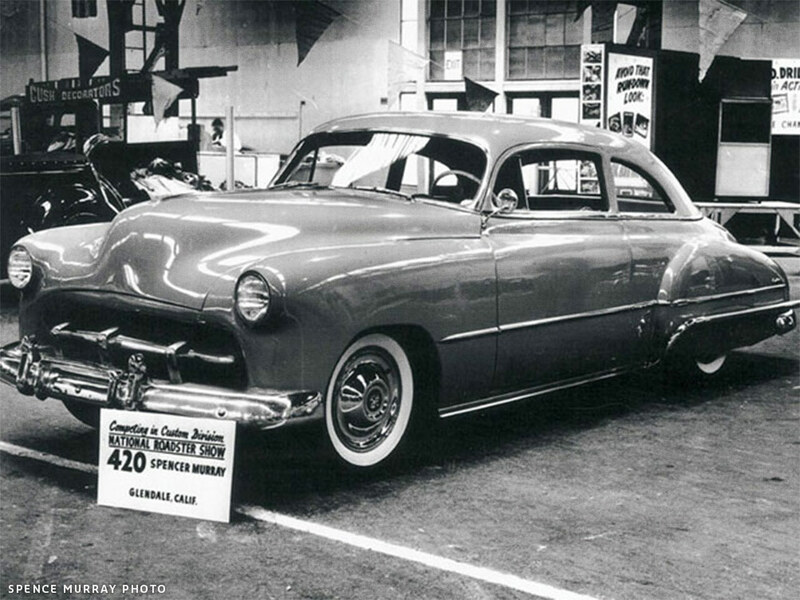 Spence Murray took his 1941 Chevy to Link Paola for a few updates when money allowed. Link smoothed the hood and trunk and lowered the suspension and added skirts. Then Spence took it to the Carson Top Shop for a stock height padded top. Spence could or would not afford the extra $50 for chopping the windshield at the time. The car changed a bit over time and in the end Link had added a low mounted custom grille into a smoothed front end. And the side trim was removed from the rear quarters and party from the doors. Decked trunk by Link Paola. Side view shows basically all stock ’41 Chevy with the stock height padded top and three bar propeller aftermarket hubcaps. The final version of the ’41 Chevy had a beautiful speed-boat stance, black wall tires (there were no white walls at the time) smoothed front with custom grille. Not to long after this photo was taken Spence traded it to get a ’46 Chevy Fastback. 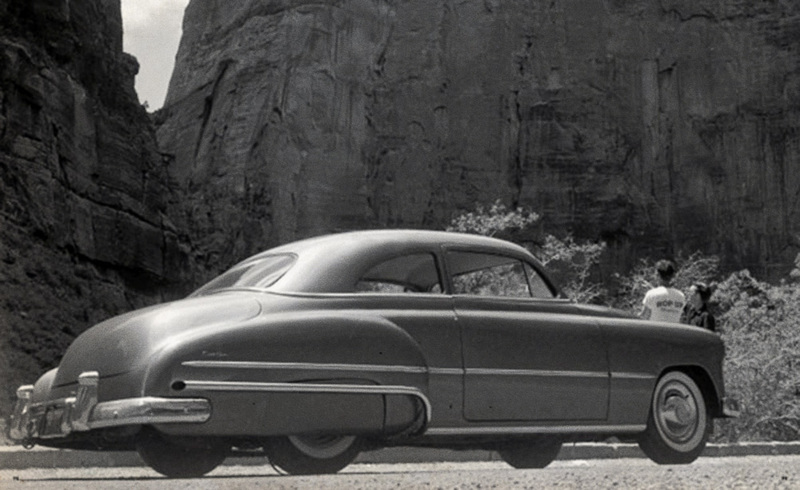 The 1946 Chevrolet Fastback Spence got shortly after he had returned from the U.S. Navy. 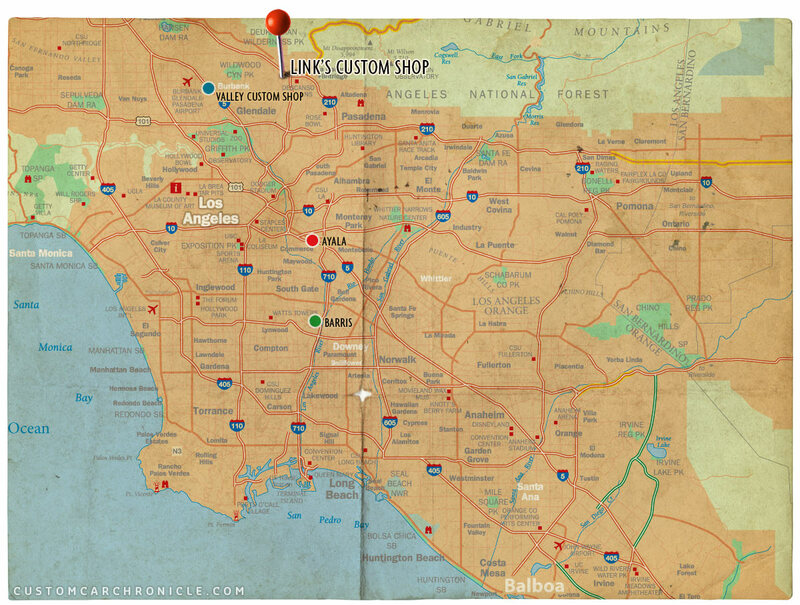 He again took it to his friend Link Paola for a Custom update which included a set of full fade away fenders he bought Jimmy Summers for $69.50. Link also added a few other mild touches to the car, and in 1949 Spence sold the ’46 to be able to buy a brand new 1949 Chevy fastback. Sadly there are no photos of the ’46 Chevy and early stages of the ’49 since the photos were destroyed due to flood damage. For the ’49 Chevy Spence wanted something a little more dramatic, a full Custom with chopped top.It was 1949 and Spence started working at Link’s body shop, doing body sanding, fixing small dents, and driving the shop and tow truck of Links Shop. By then Link was doing more and more regular body work, which was a lot less time consuming than Custom Restyling. He also went on to buy cars that had been totaled in crashed from insurance companies, fix them up with spare parts and junk yard parts and sell them again. 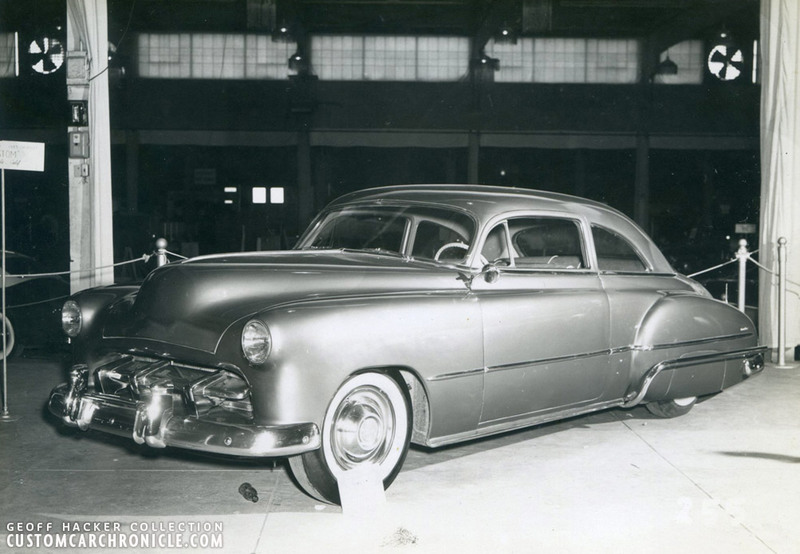 At the time Spence brought in his ’49 Chevy fastback to have Link work on it, Link was just working on a crashed ’49 Chevy Sedan with damaged body, but intact frame and front end. Link proposed to Spence to use his fastback body to fix the damaged car and sell it to an already lined up customer, and then find a new body he could chop for Spence in his spare time as a trade at a later moment. Spence agreed as long as he could use the shop truck as transportation until the ’49 was done. The original version of the car with just the top chopped and non of the other modifications done in yellow, which was the original color of the Chevy, and purple on the top. Both Spence and Link did not think the darker color on the top really benefited the chopped look, so they soon started doing the rest of the body work and would end up painting the body in one color only. Some time later Link found a suitable Sedan body and started to work on it in his spare time. And in September 1950 he started to chop the top 3 inches with some beautiful lines, shaved the drip rails, and rounded the door corners. Link performed all the work together with a few other shop workers after hours and in the weekends to keep his promise to Spence. The car was first painted yellow, which was the Chevy’s color and a custom mixed purple top. Shortly after that the car was back in the shop for round two. Nice low angle photo shows off the unique outside rear fender wrap around tailpipe. One of the key elements on the car that got noticed everywhere the car went. Spence used a set of aftermarket Cadillac Sombrero look-alike hubcaps. Spence Murray’s ’49 Chevy at the 1952 Oakland Roadster Show. This time the car was lowered, nosed, decked, shaved, frenched headlights, and shaved taillights. New taillights were added to the bumper, and at the front a ’49 Mercury grille shell was molded in place and an 1951 Plymouth grille was mounted inside it. The June 1952 issue of Hop Up magazine, which was actually written by Spence, states that the body was channeled over the frame as well. Plus an additional lowering job with two inch lowering blocks in the rear brought the car down to perfect height. After all the work was done Link painted the car in a metallic mustard enamel, and we added some very distinctive wrap around exhaust pipes. Notice the smoothed rear fenders and the small taillights mounted just inside the silence plate guard on the rear bumper. The exhaust pipe follows the side trim and adds to the optical length of the car. The Chevy at the Indianapolis Custom Car Show. Spence entered the Chevy in the 3rd Annual Oakland Roadster Show in February 1952 where it took Second Place. Dean Batchelor was at the show and was very impressed with the car, and that is how it ended up in the June 1952 issue of Hop Up Magazine. Later Spence took the car on a “Cross Country” trip all the way to Indianapolis for the Custom Auto Show as well as to attned the Indy-500 race.Photographer Ralph Poole joined Spence to take picture along the way for an upcoming Hop Up magazine article. “6000 Miles in a Custom” (Hop Up , September 1952), which was written by Spence and launched his career as automotive writer. In this article we have collected as much information on Link Paola as we could find, which is quite a bit, but I guess still only the tip of the iceberg. Link has bean in business as Custom Body Shop for at least a decade, and must have produced a lot more cars during that period than those listed in this article. Hopefully somebody will know more about Link, and the cars he restyled from the late 1930’s till the early 1950’s. Hopefully one day we will be able to share more info, and more photos of the cars he created, and perhaps of the shop’s from where he worked. If you have any more information on Link Paola, please Email Rik so we can add it to this article for everybody to enjoy.